"Seven years is a long time in the automotive industry -- and, it now seems, the full-size truck market. We've watched Ford introduce twin-turbocharged engines, Ram roll out rear coil springs and active aerodynamic touches, and GM recently completely overhauled both the Chevrolet Silverado and GMC Sierra. 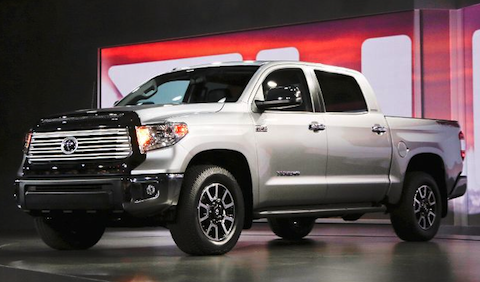 Toyota, however, has done virtually nothing to amend its Tundra since it debuted in 2005 -- but that changes with the 2014 Tundra." Arms Victory for 2nd Amendment - No Arms to States that Restrict Citizens! Listen to what Obama is doing, Ronald Reagan knew! Want to see how Socialist Obama is simply re-reading the same old nonsense? Ronald Reagan spoke out about the same exact liberal and socialist principles that Obama's plans create. Poverty. This is a long one, but worth watching. Take note how the struggles then are the same struggles today, and how the Socialists are using the same tactics to take your money in Taxes and how they are still trying to throw out the Rule of Law. Be careful, it is happening before our eyes. Compare the truth against Obama's lies. http://www.pjtv.com/s/GEYTKMBS Higher gas prices. Higher unemployment. Higher debt. Increased tensions in Asia and the Middle East. Colonel Allen B. West thinks the state of our union is failing. Hear why as the former Congressman delivers his response to President Obama's State of the Union address. Real President, what we really need in the White House! If we had a leader that thought this way, and more people who agree, our society and world would truly be paradise!